T here is an ongoing debate about the civil war in Syria and the role the United States is playing, should play, will play or won’t play. One option is “boots on the ground” or the deployment of troops to the region, a physical presence. To examine another option, look to Influence without Boots on the Ground: Seaborne Crisis Response, a recent publication by the Naval War College in their Newport Papers series that explores the power and influence of the United States Navy. 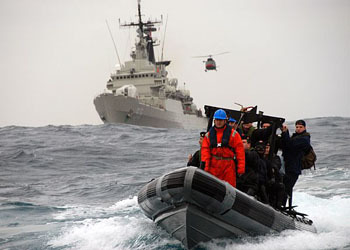 The Navy is unique in that it has the ability to operate on, above, and under the surface of the sea and has presence around the world since most countries are near the sea or within range. Influence without Boots on the Ground explores the political use and impact of naval forces during foreign-policy crises that fall short of full-scale warfare. The first chapter, entitled “Navies Are Able to Do Things That Armies Can’t”, explains the role of the Navy in the context of the U.S. military and how it differs from other branches. The author emphasizes that the Navy is unique in that its presence alone can comfort allies and pressure enemies. The second chapter piggybacks on the first by examining the concept of naval diplomacy and the many theories that accompany the concept. The third chapter– “Uncharted Waters: Data on U.S. Naval Activity Short of War”— identifies different data models and ways of gathering information and crunching the numbers to determine the Navy’s influence in international crises, from disaster response to ethnic cleansing, anti-piracy, combating drug and human trafficking and more. The final two chapters bring together the ideas of the entire publication by using case studies to illustrate the theories and data presented in the previous chapters. While Influence without Boots on the Ground is intended for a specific audience in the naval and military scholar community, the general public will find the first chapter the most readable section as it uses more common historical references to demonstrate the Navy’s influence. The most important part of the publication is the case studies in the later chapters that look at the U.S. Navy’s involvement in conflicts in the Middle East, Africa and Latin America in the second half of the 20th century. The case studies simplify the complex theories and data by giving real life examples. While the specific name of ships and air craft carriers is over most people’s heads, naval enthusiasts will enjoy the detailed information and accounts of the conflicts used in the case studies. Check out Influence without Boots on the Ground: Seaborne Crisis Response to brush up on your naval knowledge and make an informed opinion regarding current events. All in all, you may learn that the sea can be mightier than the sword. HOW DO I OBTAIN “Influence without Boots on the Ground”? Buy it at GPO’s retail bookstore at 710 North Capitol Street NW, Washington, DC 20401, open Monday-Friday, 9am to 4pm, except Federal holidays. Call (202) 512-0132 for more information. About the Author: Our guest blogger is Emma Wojtowicz, Public Relations Specialist in GPO’s Office of Public Affairs. Government Book Talk Editor: Michele Bartram, Promotions & eCommerce Manager for GPO’s Publication and Information Sales Division.